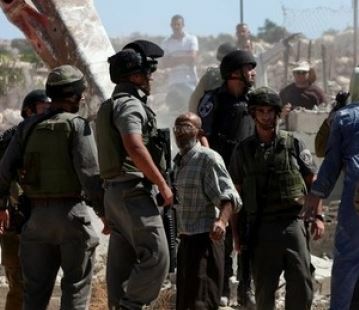 The Israeli occupation forces (IOF) on Tuesday rounded up a Palestinian student from the southern West Bank city of al-Khalil, demolished civilian structures in Occupied Jerusalem, and threatened to knock down Palestinians’ family homes in Yatta. 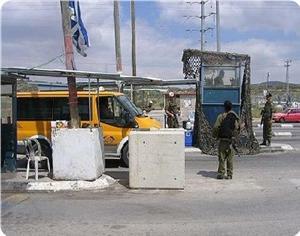 A PIC correspondent quoted local sources in al-Khalil as reporting that the IOF troops, stationing at the Wadi al-Nar (Container) checkpoint, near Bethlehem, stopped a civilian car moments before they forced the Palestinian student Iyad Omar al-Salibi out of the vehicle and dragged him to an unknown destination. Dozens of Palestinian students and civilians have lately been arrested at the Container checkpoint, pitched between Bethlehem and al-Khalil city, while they have been heading to their universities and workplaces. Meanwhile, the IOF patrols stormed Azmout village, east of Nablus city, to the north of the West Bank, and launched a frenzy-stricken combing operation, spreading a state of panic among children and women. The Israeli occupation soldiers further broke into Palestinians’ family homes in the area and ransacked them after having locked up the native citizens in single rooms. The IOF attacks culminated in the abrupt demolition of a number of Palestinian residential and agricultural structures set up east of Occupied Jerusalem under pretext of illegal construction. 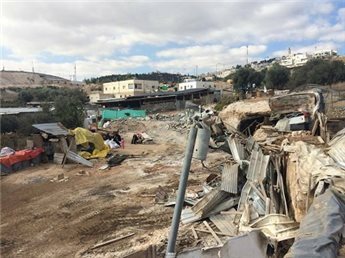 The Wadi Helwa Information Center in Silwan city said the invading IOF troops razed three Palestinian homes and agricultural barracks in al-Tur neighborhood to the ground using a drove of bulldozers and military kits, without any prior notifications. The targeted structures owned by al-Zur’ee family and covering an overall area of more than 200 Km2, are a home to at least some 23 Palestinian citizens, all of whom have gone homeless due to such an unexpected move. Observers said the Palestinian land owners have been the only native inhabitants of the area and have set up roots in the spot since the early 1980’s, before the Israeli occupation authorities ordered them to leave the area in 2003, soon after Israel’s launch of the construction process of the Apartheid Wall. Similar attacks cropped up in Beit Hanina, north of occupied Jerusalem, where the IOF knocked down the wall of a Palestinian home in an attempt to open up a new passageway leading into an Israeli settlement outpost. The IOF further issued a set of demolition threats targeting two Palestinian houses and livestock structures in Yatta, in al-Khalil, coordinator of the popular committee against settlement in Yatta, Raed Jabour, reported. Palestinian specialist in settlement affairs Khalil Tufkaji warned that the Israeli occupation state is seeking to take over as many Palestinian homes and properties as possible in east Jerusalem, especially in Silwan district, in order to accomplish what it describes as the "holy basin" project. Commenting on settlers' occupation of Palestinian homes recently in Silwan, Tufkaji said in press remarks to the Palestinian information center (PIC) that seizing such real estate means that the Israeli side has started to intensify its Judaization activities in Silwan in order to present it as a Jewish-owned area and thus resolve the issue of the so-called holy basin. "To them (Israelis), the holy basin represents the heart of the Judaization project in Jerusalem city, particularly from Ras Al-Amoud, which includes Ma'ale Hazeitim and Givat Zimal settlements, to Beit Yehonatan outpost," the specialist explained. He affirmed that the Israeli occupation has managed so far to create 45 Jewish outposts in Silwan district, comprised of about 60 housing units, and plans to seize more Palestinian homes and demolish 88 others in Silwan in order to Judaize the whole district. Forces, on Monday, demolished a Palestinian-owned shed being used as a car wash shop in the town of al-Khader, to the south of Bethlehem, according to security sources. The car wash, belonging to one Mr. Eyad Isa is located at the eastern entrance of the town, was destroyed under the pretext of construction without permit. 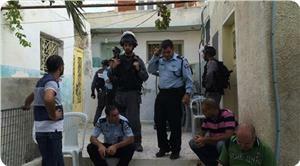 A closure was also imposed on the entrance and residents’ movements obstructed. WAFA reports that Israeli forces regularly target residential homes and livelihoods in an aim to force them to leave their homes as a prelude to take over the land. While settler violence is overlooked and even facilitated by Israeli authorities, Palestinians are rarely ever allowed proper construction permits to build or simply add on to pre-existing structures. The Israeli parliament of the Knesset is expected to decide on a new bill, this coming month, which would impose both a temporal and spatial division of al-Aqsa Mosque compound between Muslims and Jews, said Israeli sources. 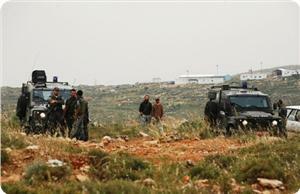 In the South Hebron Hills, Israeli forces continue to deny Palestinians access to their land. while illegally allowing colonial settlers to build there. According to WAFA correspondence, the bill will give Jews permission to pray at al-Aqsa Mosque as part of a proposed motion of equal right to worship for both Muslims and Jews. However, the bill aims to specify certain times and places for Jews to perform prayers and Talmudic rituals. 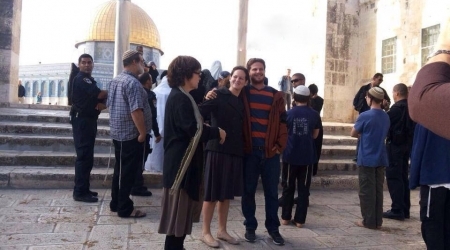 The bill additionally calls for banning protests against Jewish entry into the compound and imposing penalties upon whoever organizes or participates in such actions. Meanwhile, Israeli forces continue with their policy of denying Palestinians access to their land in the Southern Hebron Hills, attacking owners and activists and illegally allowing Israeli settlers to take over and build structures on Palestinian-owned land, according to a press release by Operation Dove. Palestinians in the region have been denied access to their land since 2001, as forces repeatedly declare the areas to be ‘closed military zones’. In solidarity with the community, Jewish and international activists have joined Palestinians in non-violent demonstrations in protest of the illegal Israeli measures. Such demostrations are routinely suppressed, as Israeli force attack and abduct peaceful protesters under the pretext of entering ‘restricted areas’. On October 18th of this year, Israeli forces were reported to have violently suppressed two non-violent actions organized by the South Hebron Hills Popular Committee. The first of these incidents took place in the area of Umm al-Arayes, located near the illegal Israeli outpost of Mitzpe Yair, while the second occurred in the village of Susiya, near the Suseya settlement. These protests were organized in demand of the right for Palestinians to access their own land, which is under constant threat of dispossession for the sole benefit of settlement expansion. In Umm al-Arayes, Palestinian landowners, accompanied by Israeli activists and international volunteers, gathered in demand of the right to access their land. Forces blocked protesters, declaring the area as a closed military zone, while abducting two Palestinians and four Israeli activists. During a similar action on Saturday, Israeli activists were brutally attacked by settlers from ‘Mitzpe Yair’ settlement, as seen in the video. 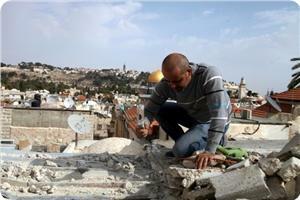 The Israeli occupation authority (IOA) on Saturday forced a Jerusalemite citizen to demolish his house with his own hands at the pretext of unlicensed construction, Palestinian local sources said. The sources explained that Amin Abdul-Haq, from Ras Al-Amoud area near the Aqsa Mosque, found himself forced to knock down his own house after the IOA threatened to make him pay an exorbitant fine if he did not do it himself. The IOA in occupied Jerusalem prevents the Palestinian natives from getting construction licenses under many flimsy pretexts and sometimes demands them to fulfil extremely hard conditions and pay hefty fees in order to allow them to build on their own lands or expand their property. The Israeli Occupation Forces (IOF) expelled on Friday evening Palestinian farmers from their fields in Qaryout town south of the West Bank city of Nablus, local sources reported. 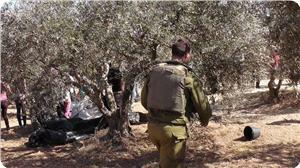 The Israeli forces ordered the farmers to leave their fields within an hour; otherwise they will be expelled by force. The farmers, however, refused to do so, the sources added. The cultivated land lots are located at the southern entrance to the town between Shilo and Eilih settlements. The villagers declared their total rejections to meet the Israeli racist and unfair restrictions that aim to displace Palestinians and confiscate their lands for settlement expansion. 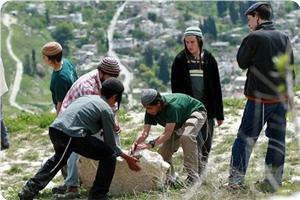 The Israeli restrictions came in response to Israeli settlers’ demands, the sources charged. Israeli soldiers invaded, on Thursday, Palestinian agricultural lands belonging to residents of al-Khader and Nahhalin town, southwest of Bethlehem, and declared them a closed military zone. 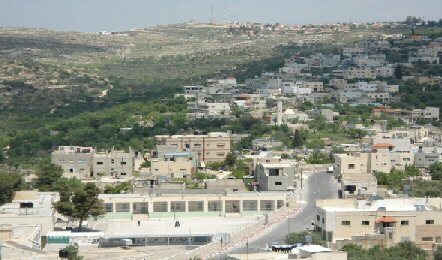 Ghassan Najajra, a nonviolent activist with the Popular Resistance Committees against the Wall and Settlements, stated that the army confiscated by force three Dunams of Palestinian lands in Sirb at-Teen area, close to the illegal Daniel settlement, built on lands belonging to al-Khader. Najajra added that the soldiers bulldozed the lands, and placed signs declaring them a “closed military zone” and another sign stating that Israel will be building “public gardens” for Jewish settlers living in nearby illegal settlements. He further noted that the army informed the owners that their lands are now “state-owned,” and off-limits to the Palestinians. Israeli authorities distributed, on Wednesday, eviction notices to 19 Palestinian families in the area of the northern Jordan Valley, as a prelude to using the lands for military purposes. Head of Al-Maleh Valley Local Council, Aref Daraghmeh, told PNN that Israeli forces served 16 families in the Al-Ras Al-Ahmar region with eviction notices, as they intend to use the area for military exercises from the 19th to the 21st of this month. Forces also notified 3 other families in the area of Al-Burj, of similar plans for military training, from the 22nd to the 29th. The military training starts at 6 AM until 7 PM. Mr. Daraghmeh added that this was not the first time valley residents were threatened with evicition, as hundreds of families were evicted last year as well. 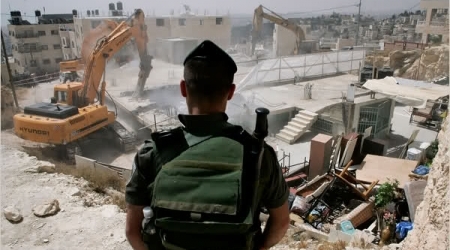 Several Israeli military jeeps invaded, on Tuesday evening, the Wadi an-Nees area, south of the West Bank city of Bethlehem, and handed nine families military orders to demolish their under-construction homes under the pretext of being built without construction permits. 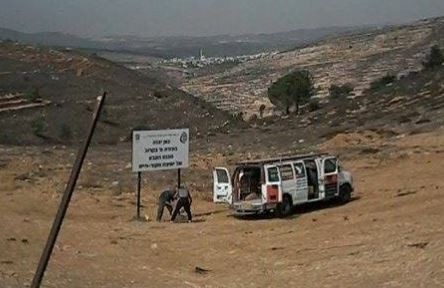 Head of the Wadi an-Nees village council Yousef Abu Hammad said dozens of soldiers invaded the village, and handed the warrants to the families, informing them they have 45 days to file official appeals with the Israeli Supreme Court. 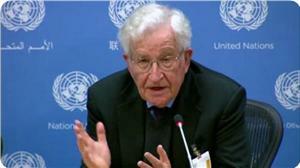 Abu Hammad added that similar orders were handed to the families eight days ago, on September 30. 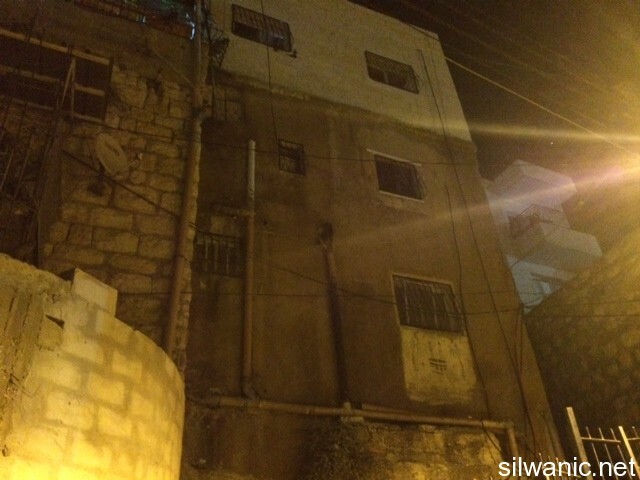 The homes belong to residents Nasri Mohammad Abu Hammad, Issa Mohammad Abu Hammad, Osama Naji Abu Hammad, Anwar Saqer Abu Hammad, Rateb Mohammad Ahmad Abu Hammad, Ali Ahmad Mousa Abu Hammad and Salah Na’im Abdullah Abu Hammad. Israeli largely denies construction permits to Palestinian families in their own lands, in Area C (approximately 61% of the West Bank) under full Israeli military and security control. 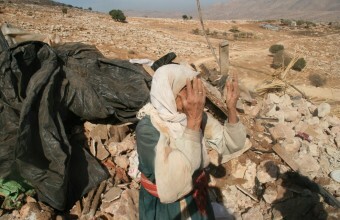 While the Palestinians are losing their lands and orchards in Area C, are largely denied access to what is left of their lands that became isolated behind the Annexation Wall, and are denied the right to build, Tel Aviv continues its illegitimate policies of the construction and expansion of Jewish settlements.